Article: The Remarkable Larsen Thompson Celebrated Her Big Night At Her BELLO Magazine Cover Issue Party! The outstanding Larsen Thompson is truly on top of the world. 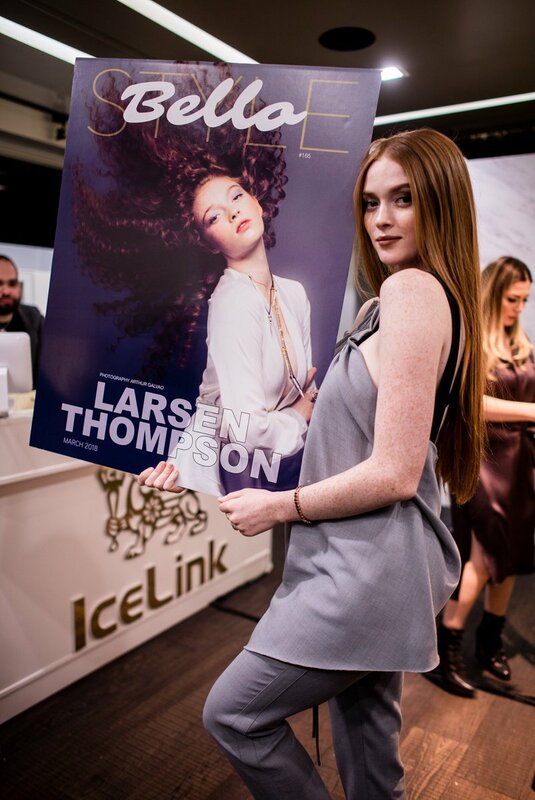 From being a stellar, dancing queen to taking over the entertainment world by storm as one of the most in demand models – Larsen Thompson excels in everything and anything that she does. Already, Larsen Thompson has had a countless amount of awe-inspiring successes such as being in numerous music videos for internationally-acclaimed artists including P!NK, Katy Perry, BORNS, and many others. She also has worked with some of the most respected brands including Dior, Juicy Couture, Betsey Johnson, Gap, and the list goes on and on. Now, Larsen Thompson can add “cover girl” to her never-ending list of wonderful and well-deserved successes! The exceptional Larsen Thompson celebrated an exciting night as the cover girl for the renowned BELLO magazine’s latest issue. The spectacular Larsen Thompson looked absolutely dazzling and was shining even brighter on her big day. The fantastic celebration took place on March 14, 2018 at the Ice Link in West Hollywood, California. Larsen Thompson looked so flawless wearing a grey, Jason Wu outfit – so classy, stunning and elegant. The party continued with fun photo-booth pictures and dancing the night away along to the DJ’s greatest tunes at the venue’s rooftop. BELLO magazine shared some pictures of Larsen’s cover issue as seen below. Needless to say, she takes our breath away with all of these phenomenal pictures. First look at our upcoming BELLO Style cover with the amazing @larsenthompson ✨❤️✨ Photography @artgphoto Art Direction @alekandsteph Styling @styledbyambika Hair @briporschehair MakeUp @grace_phillips Production @maisonpriveepr_la @bellomediagroup @iamsocialadam Styling assistant @daninovoa ✨❤️✨ So excited for everyone to enjoy this new issue coming out in just a few days. First look at our upcoming BELLO Style cover with the amazing @larsenthompson ✨❤️✨ Photography @artgphoto Art Direction @alekandsteph Styling @styledbyambika Hair @briporschehair MakeUp @grace_phillips Production @maisonpriveepr_la @bellomediagroup @iamsocialadam Styling assistant @daninovoa ✨❤️✨ So excited for everyone to enjoy this new issue coming out in a few days. Larsen Thompson is a gem and one of the most kind-hearted people anyone will ever meet. She truly deserves all of her successes and there is only many more coming for someone as sensational as she is. I, Alexisjoyvipaccess had such an excellent time celebrating Larsen’s fabulous night and here’s to many more magnificent moments in her brilliant career. incredibly proud of my best-friend! so happy to have celebrated your @BELLOMag cover issue, @larsenthompson ❤️❤️ you’re one of the most beautiful people I know inside & out … here’s to many more well-deserve successes! 😘💋 love youuu, xo. Follow Larsen Thompson on Twitter and Instagram: @LarsenThompson and be sure to send your congratulatory wishes her way! Previous Article: Learn More About Nickelodeon’s Brand New Show, “Cousins For Life” Here! Next Article: Nickelodeon Offers An Unforgettable, Social Virtual Reality Experience Called “SlimeZone” At IMAX VR Centers!